We already know that I love to fancy up my grilled cheese. It’s just so much more delicious to add a few complimentary flavours to an already-amazing combo — bread + cheese = heaven! 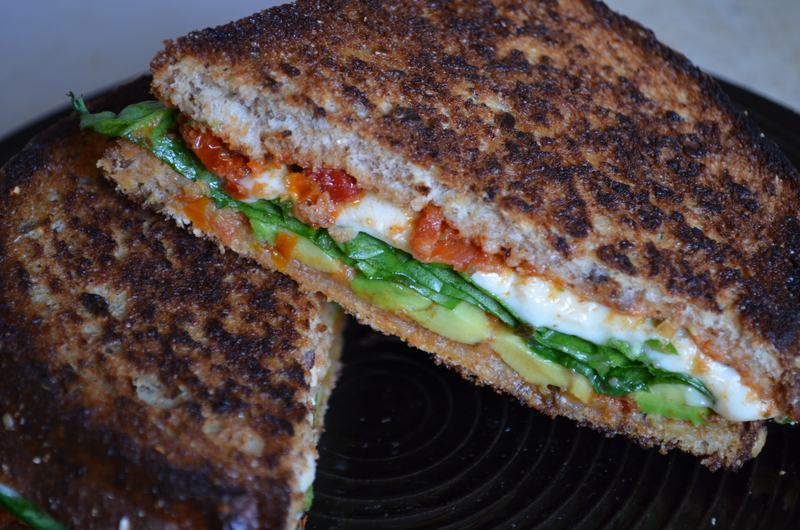 But what happens when you combine fresh mozzarella, spinach, avocados, and sundried tomato pesto? It’s a happy tastebud explosion! I’ve realized recently that I like using olive oil when I’m grilling my sandwiches. The oil is healthier than butter or margarine, it’s vegan, and it gives the bread a pleasant crunch without making the sandwich overly greasy. I definitely recommend giving it a try. I have been getting into grilled sandwiches a lot lately. Think gourmet grilled cheese, but not necessarily with cheese, and filled with lots of veggies and other delicious things. The possibilities when you’re making sandwiches are pretty much endless, but it’s easy to fall into old routines and get bored quickly, which is why I think grilling your sandwiches adds a new and exciting dimension to the whole process! This particular grilled creation is packed with healthy spinach, avocado, and homemade hummus, with a touch of sundried tomato pesto for extra flavour. I try to stick to whole grain breads as much as I can, to ensure I’m getting healthy fibre and keeping my refined flour intake low. Plus, the texture of grainy bread goes so nicely with the smooth avocado and hummus. The great thing about this recipe is that you can substitute a different type of bean dip (white bean dip is an awesome sandwich filling!) and totally different veggies, depending on what’s in your fridge and what suits your fancy at the moment. It’s an awesome vegan/vegetarian lunch option for any time of year. I would love to throw a lunch or dinner party someday with a huge array of breads and fillings, where everyone could build their own sandwich and then have it grilled. Don’t you think that would be fun?! Oh boy have I been bad with my blogging lately! I was expecting to find that I would have more time to cook and blog once summer came around, but I’ve been surprised with how little of both I’ve managed to fit into my schedule. On the bright side, the things I have been cooking have been really simple, fresh, and tasty, just like this salad I’m about to share. I visited my cousin in Toronto a few weeks ago and she turned me onto “chunky” salads, i.e. salads without greens in them. There’s something to be said about biting into nice big cubes of fresh summer veggies — especially when there’s also cheese involved! This salad reminds me of a traditional Greek salad, but the choice of cheeses and the inclusion of avocado give it a bit of a new twist. I have fallen off my breakfast smoothie wagon lately, although I am still eating breakfast daily! (I am very proud of this.) However, I’ve come up with a new and delicious version of a green smoothie, which I’m happy to share today! The original clean green smoothie recipe I wrote is still the one I revert to most often when I’m reaching for my blender in the morning. I like its light flavour and texture, and the ginger really gives it some zing! This smoothie is pretty different, as it contains both peanut putter (or your choice of substitute nut butter) and yoghurt. It is heavier and creamier, less fruity, but more protein-packed. Either way, it’s nice to shake things up a bit and try new ways of getting my metabolism up and running in the morning, so this is a welcome addition to my breakfast rotation! When I’m in a hurry to get something nutritious and filling in my stomach after a long day, I often turn to pasta dishes. I tend to load up my bowl of noodles with whatever “extras” I have in my fridge, and most of the time, that includes lots of vegetables! In fact, I try to keep my pasta-to-veggies ratio at about 1:1, so that I’m filling up on vitamin and mineral-rich foods and keeping my carb intake reasonable. This pasta dish combines fresh asparagus and frozen green peas with loads of fresh basil pesto — it is bursting with flavour and nutrients, and takes a jiffy to prepare! With so much green goodness in my bowl, I couldn’t help but name it accordingly. Becca also started her very own food blog recently, so you should check her out at The Cozy Kitchen and spread the food blogging love — especially if you’re on a gluten free diet. She’s got you covered, and then some! In the spirit of St. Patrick’s Day, she has created a detoxifying salad for you… so if you’re planning on having a few drinks tomorrow, keep this recipe in mind as a pre- or post-celebration meal. You may want to use it to nurse your body back to health later. If you’d like to see the last two installments of Foodie Friend Friday, click here (#1) and here (#2).